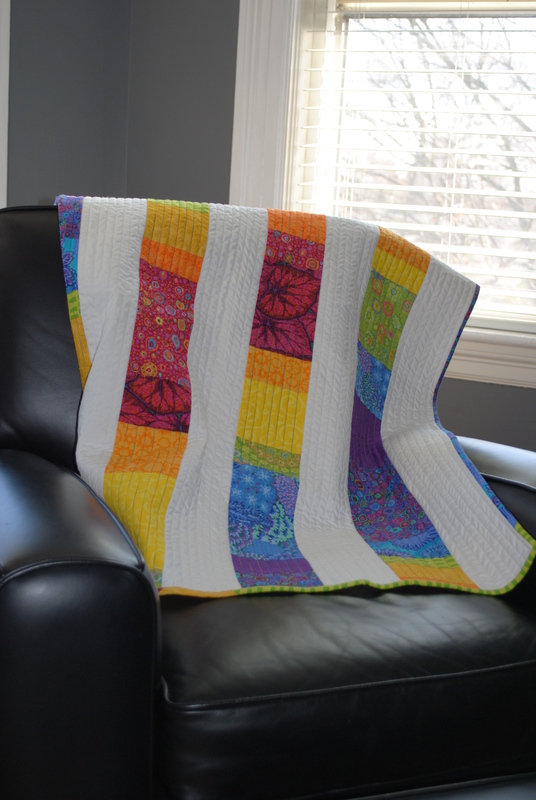 This quilt is based on a design that I created many years ago for a friend’s baby quilt. The nursery was brown and green and I needed a pattern with a more modern look to fit with those colors and the modern design in the fabrics. When I made “Rainbow Sprinkles” during my maternity leave in 2012, I think that I wanted something fun, bright, and organized to balance with what my life was like at the time. I bought the brightest white fabric that I could find (It’s a Kona Cotton.) and I pawed through my stash for my brightest fabrics in a rainbow of colors. (There are a lot of Kaffe Fassetts in here.) I spent many happy hours at the sewing machine with a rainbow stack next to me sewing patches together. When it came time to quilt, I also went to my favorite section of the thread drawer and pulled out a rainbow variegated thread for the colored patches and a white for the background. It’s simply, but heavily quilted with straight lines to emphasize the verticality of the colored strips. For the binding, I went back to the rainbow stack and used strips of all of the fabrics in the quilt to create a rainbow around the edge. This quilt brought me so much joy to make and it continues to be one of my favorite quilts. I think it would be a gorgeous baby quilt for someone not into saccharine sweet pastels. Hi Julie! Ended up on your blog and enjoyed seeing the pieces you previously shared with the AST group! I am impressed with how prolific you’ve been plus keeping up a blog. So what do you think of keeping up your blog – does it take time away from your ‘work’ or do you find that your work & your blog inspire each other? Thanks, Carol! You ask a great question. I don’t find keeping up a blog to take too much time away from work. Now that I am using a digital camera, each post really only takes a few minutes from start to finish. I don’t know if my blog inspires my work, but it definitely encourages me to share what I am working on, even if my readership is small, and I am sure that there’s a benefit in putting my work out there in this small way.